SKOPJE — Head of the Orthodox Diocese of Ohrid Archbishop Jovan Vraniskovski has been released on parole. The Court of Appeal in Skopje rejected the appeal by the public prosecutor, who wanted Vraniskovski to continue serving his sentence. The court decision to release Vraniskovski is valid until March 23, 2017, according to the Macedonian news agency MIA. The canonically unrecognized Macedonian Orthodox Church – Archdiocese of Ohrid (MPC) sought Vraniskovski’s release after mediation from Russian Orthodox Church Bishop Ilarion Alfeyev, who asked for a pardon for Vraniskovski during his visit to Skopje on December 21, 2014. Since 2003, the Macedonian authorities have arrested Vraniskovski six times on different charges, including public disorder when he tried to conduct a baptism ceremony in a church the MPC sees as its own. He has also been charged with “inciting ethnic and religious hatred” for having “slandered the MPC” and spent a total of almost 18 months in prison. He was last arrested on December 12, 2011, upon entering Macedonia from Greece, on charges of having misappropriated EUR 250,000, which he used to buy land in Ohrid while serving as a bishop of the MPC. He returned to the country to request a retrial, only to be arrested and taken to the Idrizovo prison near Skopje. The MPC is canonically unrecognized, and the Serbian Orthodox Church (SPC) considers it schismatic since it declared autocephaly unilaterally in 1967. The MPC changed its name to the Macedonian Orthodox Church – Archdiocese of Ohrid two years ago. It is not recognized by any of the autonomous Orthodox churches, while SPC priests are not allowed to work in Macedonia. 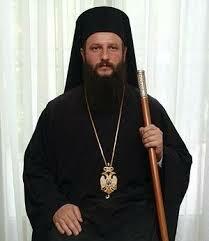 The MPC defrocked Archbishop Jovan and the SPC has appointed him as the Serbian exarch in Macedonia. The SPC believes he is the victim of rigged political trials because of his opposition to the schism, while Amnesty International and Freedom House have said that he was a prisoner of conscience.